I cried when I saw in 2006 on YouTube the winning moments of American Jason McElwain. To stay near the sport he loves, Jason, or J-Mac, signed on as “manager” during his junior varsity. He took up the same role for his senior varsity team — fetching them water, toweling their sweat. Amazed at his dedication, his coach had him suit up for the final home game of the season. J-Mac entered with four minutes to go. It was his first and only appearance for his varsity team. He hit six 3-point shots and a 2-pointer. Spectators from both teams went in frenzy applauding him. After the final buzzer rang, the crowd dashed onto the court in celebration and J-Mac was carried off the court on his teammates’ shoulders. Jason made national news and became a hero for autism. Parents from ASP Diliman Chapter dream that one day their children will be given the same opportunities as Jason - to play basketball. So in April this year, the chapter spearheaded their own version of a basketball clinic. They tapped three incoming junior Education students and varsity players from the University of Sto.Tomas — Coaches Carl Valera, Tim Angob, and JC Cochon — who took up the challenge: Here is their basketball story as gathered by Angel Talker Tiffany Tan. Sports programs are the in- thing to do during summer vacations. 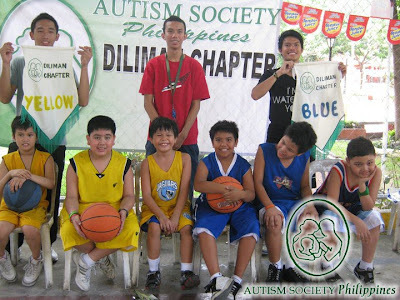 For families of children with autism, joining a regular sports clinic will be quite difficult, said ASP Diliman chapter president, Jo Palomares. “I did not grasp the enormity of this responsibility until I saw them on the first day. There were six boys with autism who signed up for the basketball clinic. We were stumped on how to teach them. But my desire to transfer the love of the game to these boys won me over,” continued Carl. Coaches Tim and JC later joined Coach Carl. EXPLAIN THE CONCEPT OF BASKETBALL FOR CHILDREN WITH AUTISM. Coach Carl: Most people often think of basketball as just shooting the ball into the ring. This is true, but there are also important skills involved, like dribbling or passing the ball; there’s also offense and defense. Our goal is to teach these fundamental skills and the rules of basketball in the simplest manner. Basketball is a complex game that requires split-second reaction, non-verbal communication, sharp instincts and team play. Coaches Tim and JC: Basketball lets them communicate, interact and cooperate with one another. It gives them the opportunity to socialize with others. Basketball also enriches them physically. Through the exercises, their bodies become physically fit; like having a workout. While working on skills that relate to body movements; they are also having fun. HOW DID YOU GET THEIR ATTENTION AND FOCUS? Coach Carl: First, we had to establish our authority in court. We were quite overwhelmed with the different characteristics they had, and some can be quite manipulative. Second was “how to get the kids’ attention. I noticed they were all thrilled to get their individual balls. I hit upon the idea of making them sit down. We made them line up, then we made them sit down on their basketballs. Eureka! Their attention was ours! The concentration needed to balance on their basketballs was enough for them to stop fidgeting. Coach Tim: We called them by name and gave them direct instructions. It was hard to sustain their focus, so we just did the routines repeatedly until they can do it. Coach JC: The stretching exercises also helped them achieve more focus. Running around the court made them lose some excess energy, made it somehow easier for us to give lectures. HOW DID YOU MENTOR THE PLAYERS WITH AUTISM? Coach Carl: Children with autism thrive on structure, so we set up a two-hour schedule daily on a 13-week session. Day 1, Orientation. The boys were excited to have their basketballs. For some, it was the first time they held one. Some of the boys were partially verbal. We asked for their names, interacted with them. We tried to give them a feel of how things were going to be the entire summer and tried to inject excitement for the coming days. Day 2 and 3, Dribbling. We demonstrated dribbling in place, then using the right hand and then the left hand. Then we practiced dribbling with them in place and so on. Mom Resy Benoza said she saw better eye-hand coordination on her son who could dribble a ball without losing his balance. He learned how to dribble, doing it inside the house and even the bedroom just to show off. Day 4 and 5, Passes. We taught the boys three kinds of passes: overhead pass, bounce pass and chest pass. We were amazed when the CWAs picked-up the skills and even memorized them. Day 6 and 7, Techniques on Shooting. Paul, who was fixated on basketball, immediately practiced his fine shooting skills on the first meeting. We trained him with drills. “Paul was five years old when he started to watch the PBA, NBA and the re-runs of the UAAP basketball. ASP Diliman’s summer basketball activity was perfect for him and his peers. Paul learned to play with other kids. Because of his intense desire to shoot the ball and regular practice, his shoulder muscles developed and grew strong. Paul was awarded the medal “Shooting King!” It definitely made my heart soar!” said mom Odette Goze Day 8 and 9, Basic Defense. The kids were divided into pairs. It naturally followed that if one is doing defense, then the other is doing offense. The first lessons were always the hardest. We would demonstrate a particular skill and guide them to do it. Constant practice made perfect. The boys joyfully discovered their bodily capabilities. The warm-up exercises and running around the court were rituals they grew to like. It broke the ice among the boys and us. We structured the drills like a two-hour kindergarten class. There was a circle time (9:00-9:15) for the warm-up exercises. The boys shouted out their numbers (9:15-9:30) running around the court/jogging; (9:30-9:50) stretching exercises; (9:50-10:10) drills followed by a 10 minute break. Drills, lesson proper, and practices (10:20-10:50). Twenty minutes before class ended was cooling down time. (10:50-11:00). We ended each schedule with circle time, put our hands together as a team, then say prayers. We taught the boys to greet each other with a high five and give the Team Shout! And lastly, Mastery of Skills. For the 13 sessions, we divided the skills into two days each, from the simplest to the most complex. We taught them mastery for one skill before moving on to the next. We simplified the activities and aimed for mastery first before team play. We personally exerted extra patience in dealing with them. We took it one skill at a time. We would lecture briefly on each skill before introducing it. From then on, it was their turn for demonstration. SINCE BASKETBALL IS A SOCIAL SPORT, HOW DID YOU TIE THE SPORT AND SOCIALIZATION CONCERNS OF THE PWAS? Coach Carl: The clinic is like a play therapy, in a group setting. A child’s maladaptive behavior is corrected within the context of play, in a non-threatening, unobtrusive manner. We got discouraged sometimes because it’s so hard to get our message across. It seemed like they were not listening. But we kept on. Later, we realized they were actually listening to us. Sometimes my co-coaches will give a one-on- one demonstration to a student. We also made sure that we really talk to them regularly, and personally. Coach Tim: Actually it’s really challenging for us to teach them, but by being firm and encouraging them to learn the basic principles and rules, socialization concerns were addressed. Coach JC: Basketball requires the players to communicate with one another. Before training, we made the students talk to each other to build camaraderie among them. In “Passing the Ball” for example, we divided them into triads. Each person in the triad called out the name of person he will pass the ball to. We did this drill repeatedly until they got faster with it. It may seem like a very simple drill, but it required the player to be constantly aware or else he will not catch the ball. WHAT ARE YOUR MOST CHALLENGING EXPERIENCES IN HANDLING CWAS AND HOW DID YOU ADDDDRESS THIS? “Our coaches, they got bitten and scratched during tantrums. But they kept going for six weeks, until their “wards” can throw their shots inside the basket,” attested mom Resy Benoza. Coach Tim: Remain at ease, calm, and patient at all times. Even if they have tantrums to the point they were hurting us, we must still stay focused and not stop teaching them the things they need to learn. We know that this can really help them improve to become better individuals. Coach JC: When we had a hard time disciplining a student or making him stop doing an undesirable behavior; what we did was talk to the student at different times so he would realize that what he was doing was wrong. I think also that the child felt the team’s disapproval with his behavior. So, during the last few days, there was an improvement and he was really easier to manage. Coach Carl: We say words like “cool down” or “keep calm” or “calm yourself” to the student, then lead the student away from the group, and let them take a rest for a while. By using very specific words like these, the student has an idea that he needs to fix himself before re-joining the group. Tantrums can make the entire group disorganized and have low morale. The challenge is to contain the tantrum without scattering the group. I learned to really put my attention on the child without losing my focus on the group. WHAT ARE THE VALUABLE LESSONS AND TIPS YOU CAN GIVE TO OTHER COACHES? Coach Carl: Children with autism are God’s gifts to us. God shows His boundless creation and creativity through special children. We can help fill their needs in sportsmanship. Through basketball, we can help them in their growth towards maturity. Put your heart to what you are doing. You must love every second or give your all and let the students learn from you and learn from your students. And of course you should also have a ton of patience; and if that is not enough, put another ton of patience. Coach Tim: Let your students feel that you care and love them. More important, you must love what you are doing so that you can teach them with all the capacity that you have. Never back down or give up until you know that your students DID LEARN. And when we achieve that, it’s an incomparable feeling. Teaching the boys in this basketball clinic was an awesome experience. And a plus for me in teaching this clinic is gaining new friends. Coach JC: Basketball is a game of camaraderie, teamwork, cooperation and leadership. Through patience and perseverance, we can make them learn in a good and clean way. Every coach should at least spend quality time to teach basketball to students with autism. I was touched and inspired by the children with their willingness to learn. I believe that they have the potential someday to be good basketball players. One of the most unforgettable moments in my teaching was when they formed their lines properly and sat on their respective basketballs; it was unforgettable because when I saw them, I knew they were really eager to learn the game. It’s hard to explain how I felt, but deep inside my heart I knew they were special to me. The moment they held the ball and began dribbling it, I can’t stop smiling inside. What a wonderful article! We need people with skills, but more importantly, we need people who are willing to THINK, FEEL and BE CREATIVE, even if they have never taught a PWA before. I pray this article encourages everyone to "take risks" and open their world to persons who happen to have autism. Thanks for this article!